The Volkswagen Group intends to phase out the use of traditional automatic gearboxes in their product range entirely, replacing them with it’s advanced Direct Shift Gearbox, or DSG. It will begin the phasing out with Volkswagen cars that have their engines mounted transversely. Research is currently being conducted to adapt the use of the DSG transmission for longitudinal-mounted engines. 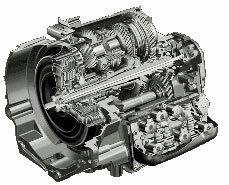 The DSG transmission is currently used in Volkswagen cars like the Passat, Golf, Touran, Eos, and the Jetta. It’s also available on the new Audi TT and the Audi A3, but Audi calls it S-Tronic instead of DSG. The Bugatti Veyron uses a specially modified DSG transmission to handle the crazy amount of power it’s quad turbo W16 engine produces. It’s also expected that Lamborghini might introduce a DSG-equipped car soon, since the Lambo-based Audi R8 will feature it. It was developed by Borg-Warner for the Volkswagen Group. It uses two computer controlled clutches. The outer clutch pack drives gears 1, 3 and 5 as well as the reverse gear, while the inner clutch pack drives the 2nd, 4th and 6th gear. Each clutch pack is comprised of 4 smaller clutch discs instead of the normal single large clutch plate found in most gearboxes. This system allows extremely precise shifting that requires only 8 milliseconds thanks to gear preselection. For example, while you are in gear 2, gear 3 is preselected to cut down on shifting time. 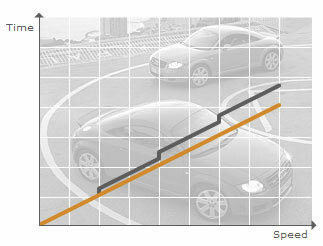 The graph above taken from Audi’s technical write-up on the DSG (S-Tronic) system shows the improvement that DSG offers over a classic manual transmission. Notice the delays in the graph where a normal human driver takes a longer time to shift gears as compared to the nearly instant 8ms shifting of the computer controlled DSG gearbox. The DSG gearbox is currently the quickest shifting automated manual gearbox out there. Here is a table with shift time comparions between the DSG and a few of it’s competitor gearboxes. Do check out this straight line performance comparison video between a manual transmission Volkswagen Golf GTI and a Volkwagen Golf GTI equipped with a DSG transmission. It features drift king Keiichi Tsuchiya.